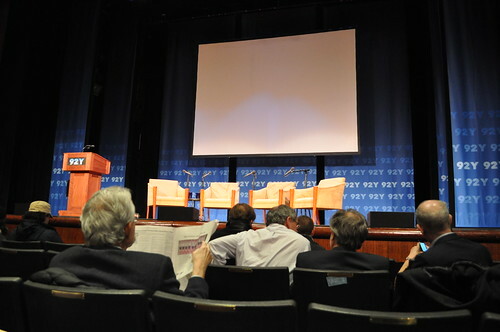 This past week, Marcus and I attended a very interesting lecture hosted by the 92nd Street Y on the Upper East Side. It was a conversation led by Adam Gopnik, staff writer for The New Yorker, between Chef Ferran Adrià, the mastermind behind arguably one of the best restaurants in the world, elBulli, and Lisa Abend, Time magazine correspondent in Spain, who has a new book released entitled The Sorcerer's Apprentices about the apprentice chefs at elBulli. The conversation aimed to discuss what goes behind the curtain at elBulli and "the small army of young apprentice cooks charged with carrying out his unique culinary vision." Calendar outside the 92nd Street Y featuring the night's event! Inside the 92nd Street Y! Wish we were able to take photos during the lecture, but the policy says otherwise. Mr. Gopnik came to stage first, prefacing the lecture with a lovely introduction about Chef Adrià and how when he was lucky enough to eat at elBulli that it seemed as if Chef Adrià was the maestro of a culinary symphony that is the essence of elBulli. He compared sharing a meal with Chef Adrià like finally a childhood fan being able to sit down and dine with Willy Wonka. I thought the description was quite clever. He also introduced Ms. Abend, too, briefly mentioning her recently published book about the young stagiaries at elBulli and how her story is from a "worm's eye view" of the famed restaurant. Once the two featured guests came out on stage to their seats (Chef Adrià with his translator), Mr. Gopnik tried to start the conversation off by asking Chef Adrià about his earliest childhood memory of food, but Chef Adrià went off on a totally separate tangent. He asked Mr. Gopnik (as well as the audience) to observe the glass of water he was holding in his hand, to think about how many times we see it daily. He noted its obvious characteristics--how it is odorless, colorless, ultimately flavorless--and how there are not many products like this in the world. He then also noted the temperature of the glass of water and how we, with our human bodies, can consume many edible temperatures (i.e., the contrast between a hot consommé and a bowl of ice cream). The moderate temperature of the water and the fact that it has no base taste and no variations in flavor is important to this observation as well, he said. He urged that we should observe it until we have used all of our senses, and once all exhausted, we will use intellect. Chef Adrià pointed out that if extraterrestrials ever came to earth, they would not know it is a glass filled with water. He also noted the link between water and our mortality if we do not consume enough of it--it is an important ingredient/product in nutrition as well as an important social issue (i.e., availability of drinking water throughout all continents in the world). So after all of this contemplation, the chef asked the audience if we should perceive food directly or through concentration? If we thought about all of things we consumed at this level of observation and concentration, he said we'd all probably go crazy, which is why he says there are certain moments in the year when you want to experience such madness. This is the philosophy behind elBulli. Mr. Gopnik looked stunned, of course, interjecting that this was the most philosophical sip of water he has ever had. Chef Adrià interjected that it is okay to do this with wine! But to continue what Chef Adrià was discussing, he mentioned that in 1980s, he was cooking with the sole purpose for others to enjoy. After contemplating this for about a decade, he changed his perspective to create a new level of gastronomy and cuisine. His mission was no longer just about pleasure and enjoyment--it became a mission to create, that is, an experience in cuisine. When he first proposed the ideas to everyone, he wasn't met with open arms. Instead, he was challenged, adding that they wanted to shut him in a mad house--that he wanted to charge $300 and make a joke out of elBulli. But Chef Adrià saw it in a different light--he started to look at cooking at that point in time like film, and what would become the forty to forty-five courses at elBulli would function as the film's "scenes." He shared with the audience that he wanted to evoke emotions in the restaurant's patrons--feelings such as generosity, memory, sense of humor, surprise, etc. When Mr. Gopnik tried to summarize what Chef Adrià was trying to convey (i.e., paying close attention in the kitchen and in cooking), Chef Adrià replied that it was much simpler than that. He gave the example of visiting the Museum of Modern Art here in New York--that you ultimately decide what you want to during your visit, that it is not always about concentration (i.e., trying to find the meaning behind every work of art, etc.). He applies this line of thinking to cooking at elBulli. The discussion about the profound ideas of elBulli and the resulting eager chefs that apprentice there each year led to Ms. Abend revealing that these lucky stagiaries arrive disappointed because instead of the "sorcery" they expected to take place in elBulli's kitchen, they're expected to perform tedious labor required in the kitchen (e.g., the corn risotto from the 2009 season's menu requires pulling out the teeny germs from each and every corn kernel)! The silver lining, Ms. Abend notes, is that these apprentice chefs learned to think more about food than they've ever in the past. For Chef Adrià, he reported that he hasn't many intensely memorable meals, but he says the meals he has had in Japan come the closest, as they are the "strangest," in the sense that they're so different (not in a bad way, of course) from Western-style cuisine. Before stepping foot in Japan, he cooked with his heart, his hands, and his head, but after leaving Japan, he then learned to cook with his soul. The example that best describes this for him is with wasabi. In Japan, they stress and highlight that the very wasabi leaf used to make it fresh on the stop was picked by someone that morning. Chef Adrià said that the Japanese see effort behind it all and emphasize appreciation--something that is elemental in the country's cuisine. While in contrast, he feels that Westerners feel something totally different--more so a sense of entitlement. On the same lines as the thinking in Japanese cuisine, Chef Adrià said he values every member of the kitchen staff equally, that the dishwasher is just as important, if not more so, as a member of the creative team. Chef Adrià noted that his relationship with food was normal from the getgo--nothing crazy as you may imagine--which made him question many aspects about food later in his life. But he was wary of letting passion for food become an obsession, which he finds to be very dangerous if one doesn't keep a certain distance between the two. In the same light, he finds creativity can be dangerous as well, with Mr. Gopnik responding that it is quite a Zen approach to food. When addressed with the question as to what role does technology play in his kitchen, Chef Adrià says that people expect to step into his kitchen and be at NASA, but instead, as presented in Ms. Abend's new book, there are forty-five people using their hands. This isn't to say that there is no technology at the kitchen at elBulli--don't be absurd! Of course there is technology. Everyone has a continuous relationship with science and technology, especially with the omnipresent mobile phone these days, he pointed out, but nobody really thinks anything of it. But when it comes to the cooking and kitchen at elBulli, people expect different things. Chef Adrià added that science in cooking requires knowledge, not only of the culinary arts, but also of design, history, ecology, etc. He reiterated that things like liquid nitrogen (something that people always ooh-and-aah over when it is used in cuisine) aren't super technological--when it dissipates, it disappears right into the air that we breathe. It is all incredible amazement, but in reality, it's just a product, he added. Ms. Abend noted that many of the apprentices asked to be moved from the kitchen to the front of house as part of the service team. So instead of loading tricks in back of house (i.e., in the kitchen), they wanted to see the magic in action (i.e., the reaction on patrons' faces as they're working through the "scenes" of Chef Adrià's culinary "film") noted Mr. Gopnik. Chef Adrià mentioned he separates ingredients and the cooking of those ingredients into coherent courses into two categories. The first is a product-based cuisine (e.g., raw tomato), and the second is preparation-based cuisine (tomato salad, tomato soup, tomato sauce, etc.). He said he finds that it is always an issue in cooking, especially for traditionalists who dine at elBulli. It is obvious to Chef Adrià that you wouldn't enjoy it if you were looking for product-based cuisine. In the same way you can eat steak raw, you can also humanize it by cooking it, however style you want. Ms. Abend noted that Chef Adrià never repeats a dish for a single diner (in a given season). She said that it has been like an evolution through past seasons to the current one--moving from product-based cuisine (as discussed above) to preparation-based cuisine. When Mr. Gopnik asked Chef Adrià when he started molding the poetry of elBulli to begin evoking memories, Chef Adrià answered, quite aptly, "When I met journalists--I was inspired not to repeat dishes." He felt he had to be radical--if it was only a subtle change to elBulli, why bother to change at all, he reiterated. He continued to say that he could've continued elBulli for the next fifteen years, compiling a menu of "top" dishes from all the past seasons and live off that, mainly because diners would likely not know if anything had been repeated. Chef Adrià briefly discussed his upcoming book that will be released in October of this year, which will focus on "Family Meals" (aka cooking at home). For staff kitchen meals, the challenge was putting a limitation of the amount to be spent on ingredients yet to be able to create a good meal. He noted that most recipe books usually are written for four servings. Ironically, he said, all the people I know that do cook at home are either singles, doubles, or have kids, which may require less portions and a completely different menu. Continuing on the book discussion, he said the difference between professionals and nonprofessionals in cooking is basically one thing--"You're not organized!--It's like comparing Lady Gaga to Beethoven!" Chef Adrià then posed the question as to how to change this, when Mr. Gopnik replied perhaps a good palate. Chef Adrià simply answered, "Nobody knows--it's a mystery," where he then went on to say maybe it's a good palate in an "enlightened capacity." He gave the example of Japanese cuisine once again. He asked the audience to imagine that you're given a pair of chopsticks, some wasabi, ginger, soy sauce, and a piece of sashimi--but the clincher is that you have no prior knowledge that the ginger acts as a palate-cleanser, that you use the chopsticks to swirl around a small amount of wasabi in the soy sauce, and that you use the chopsticks again to season the piece of sashimi with the soy sauce. The capacity to know how, why, and what are important to knowing how to cook and eat. When an audience member asked about how elBulli addresses the ethical dimension in cooking, Chef Adrià answered saying that it seems like you can't write a book without emphasizing the uses of organic products. However, he noted, the premise of his book ("family cooking" and making cooking more affordable yet delicious) cannot use organic ingredients as it contradicts cooking on a budget, the more pragmatic approach. Ms. Abend answered an audience question about her desired last meal on Earth as the last meal at elBulli on July 30, 2011--it will be the 1,846th course served at elBulli, which is in dedication to the year that Georges Auguste Escoffier was born. Chef Adrià briefly discussed what will become of elBulli after its last season this year. It will become a "think tank" via a foundation, which aims to begin operations in 2014. Chef Adrià said he wanted to go this route because he considers himself a fortunate and lucky mean during the course of his life so far, so as a way to give back to society through culinary creativity and talent. The motto of the elBulli Foundation is a simple as this: "Freedom to create"--it will serve as the aforementioned think tank but will also serve as an archive of elBulli's history. The menu will be eliminated, and patrons will eat whatever the Foundation feels like feeding them, like the way you would eat over at a friend's house, he added. When asked why he decided to close elBulli this year, he answered with words as poetic as his gastronomical wit: "A night at elBulli is like a day in the life of a concert pianist," where the pianist (chef in this case) is constantly practicing for upcoming performances (meals in this case) that the audience (new patrons in this case) are hearing (tasting in this case) for the first time. Findings: I found the lecture to be quite inspiring and informative. Chef Adrià is quite the playful guy, and his openness and lively personality definitely made it even more enjoyable. I had read many an article about Chef Adrià and elBulli, but it was refreshing to see the chef in the flesh talk about the place that brought him to fame and success. It was also nice to hear Lisa Abend speak--I'm currently reading her book! I think the story she has to share about the stagiaries at elBulli is one of the few ways I can get close to elBulli without actually being able to eat there during its final season in 2011. Unfortunately, I was unable to meet Chef Adrià that night--the bookseller had sold out of books after I briefly waited in line, and I left my copy of A Day at elBulli at home--so that was a big disappointment. He did mention that he will be back in October to promote his new book, so I will be all over that, and I will make sure I have the copy of my book so I can finally meet him (and add said signed book to my library of cookbooks)! So if Chef Adrià is ever in town, I highly urge you to go hear him speak. He is quite the funny character--I think the slight language barrier makes it comical and light-hearted. I apologize for the wordiness--I just wanted to share everything I heard them discuss that night. So many interesting and mind-stimulating points! Price point: $29 per ticket.